Anniversary bracelets, Valentine’s Day earrings, Christmas necklaces. Some presents are too romantic for an ordinary gift box. 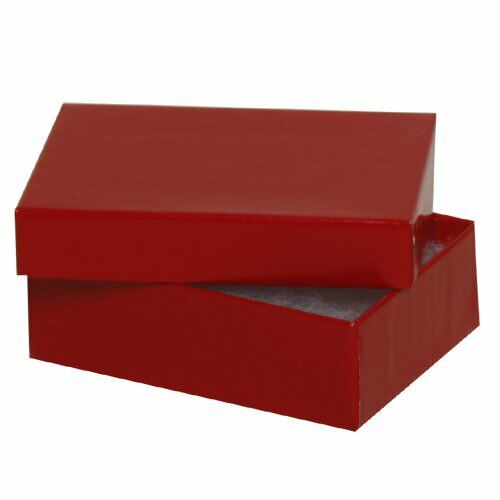 So when you’re in love and you want it to show, use our Red Two Piece Jewelry Box. This charming box is perfect for wrapping up jewelry, antique coins, and the keys to your apartment. With a romantic red finish, it is a great way to show your love on Valentine’s Day, birthdays, and anniversaries. Since we don’t believe in keeping your feelings under wraps, we designed this box so that you’d never need to cover it with wrapping paper. Just top with a bow or ribbon, and you’re all set. And when it’s done being gifted, it makes a great jewelry holder that will always remind them of how much you care. Bring out your passionate side by making this your next gift box choice! Your partner will definitely love it as much as you do! Red Two Piece Box is available in 3.125 x 2.125 x 1.